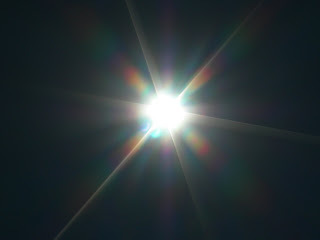 As the earth continues to travel in its orbit, the sun moves closer to the descending node of the moon’s orbit where the moon and the sun will meet in total solar eclipse on 22 July 2009 for the longest total eclipse since 11 July 1991, the longest total solar eclipse of the twenty-first century, and the longest total solar eclipse until 2132. A total solar eclipse is one of the most dazzling events a person can experience. Those who have never seen one don’t understand what all the fuss is about. Those who have are converted into pilgrims on the eclipse path. Every eclipse is different. Every eclipse is a surprise. Every eclipse has suspense. Every eclipse has more things taking place in a short time than you can possibly observe. You never get it right. And so you go back for another to sample what you missed the last time and what has never been seen by anyone in exactly this way before. This time the eclipse path passes through India, Nepal, Bangladesh, Bhutan, China, Japanese islands in the East China Sea, and a lot of Pacific Ocean. Most of the path is threatened by monsoon season, which means clouds, rain, thunderstorms, and typhoons, but the best prospects on land appear to be along the eastern Chinese coast, south of Shanghai. That is where we plan to shanghai the eclipse for 5 minutes and 54 seconds of uncanny sky. A China eclipse also offers a chance to follow other Asian astronomical trails, and Mongolia’s Lamaist monuments are peppered with astronomical and cosmological symbolism. Even the national flag of Mongolia has celestial emblems-the sun, the moon, and the magical light of the upper universe. I last visited Mongolia a dozen years ago for the Long Underwear Altaic Total Solar Eclipse of 9 March 1997. 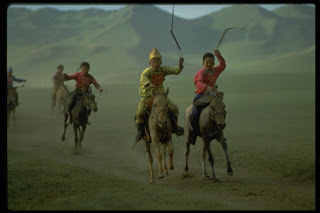 Mongolia in March was an icebox, and I am looking forward to mowing down the Mongolian grasslands in the height of summer, when the Mongols are celebrating the traditional Naadam festival with wrestling, horsemanship, and archery-skills I need to improve. We are going much farther afield in 2009, right to the heart of Chinggis Khan’s empire, Kharkhorin. Far from cities in Mongolia in the ten days or so before solar eclipse, we should also be able to access a stunning starry sky at night, and I’ll be detailing the constellations we know and the stars as they were seen in ancient Asia. After Mongolia, on the way to the eclipse, we stop in Beijing to climb the Ancient Observatory with its elaborate historic bronze instruments installed on the roof. Tourists often see these from a distance or even sometimes visit the place, but they rarely get to hear how the instruments and the observatory actually worked and who used them. I have been on that roof four times, and it is always a delight to return. The celebrated Suzhou planisphere, a thirteenth-century Chinese star map, is one of the historical treasures of world astronomy. People who go to Suzhou see its stunning gardens, but few even know about the map. We are going to see gardens of Suzhou, as will many other eclipse chasers, but the star map is not even mentioned in other organized eclipse tours. 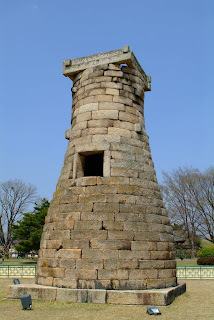 South Korea also possesses astonishing monuments, and one of the most fetching is the Cheomseongdae Observatory at Kyongju. I have wanted to get to it for decades. Built in seventh century, it is a curious bottle-shaped stone building. It is also the oldest standing observatory in Asia. Detailed accounts of it are hard to find and contradictory. Seeing the place in person is bound to be a revelation. The total solar eclipse and my work worldwide in ancient, prehistoric, and traditional astronomy confers a celestial character to this excursion into the shadow and beyond the Great Wall, but the rest of the itinerary is filled with natural and cultural wonders rarely seen and little known outside of Mongolia and Korea. The chance to sample China, Mongolia, South Korea, and a total solar eclipse in one expedition is unusual. Nobody else is doing it.